You could be the owner of a business and regardless of the size of your business you can take advantage of Foursquare to successfully divert the necessary traffic to your website and increase sales. With the ultimate goal of attracting consumers to your business, you can include Foursquare as part of your social media marketing strategy. Here is a list of tips you can consider following. The first thing that you will have to work on to attract potential consumers is become visible on Foursquare. Your business should be physically present on this social networking platform. First, you need to search for your business on Foursquare by using search names related to your business. If you do not find it you must add your business location. To do so you need to scroll right to the bottom of the screen. You will come across the option ‘Add this place’. Choose the right category that your business falls under from the list of main categories that appear on the page. Next, you need to add a sub-category related to your business. This will help in defining your business. You can also opt that the business location you added be verified by Foursquare. Business locations are verified by phone or through email by Foursquare. Now that you are visible on Foursquare you must work on some innovate ways to attract consumers to your business. One of the ways to do so is by introducing Foursquare specials and promotions. Additionally, you must make users aware that your business is running such deals and promotions. If you run a restraint, you can have a special discount for a group of people with 10 members or more. You can consider rewarding loyal customers of your business with Foursquare specials. People who visit your business with the help of Foursquare are provided with the option to leave their suggestions, comments, tips and feedback. As a business owner you must be active on Foursquare and keep track of what users have to say about your business. Positive feedback and reviews that your business receives from users who have visited your place is automatically publicity. You can work on some innovative ways of rewarding such customers. One of the best ways not to let go the customers who visited you in the past is by sending them regular updates. As a business owner you can take advantage of this new feature that Foursquare offers. You can update users with information about the latest promotions, special offers and deals that your business offers. You can attach text and images to the updates that you send. You can also have a Foursquare ‘check-in’ sign placed at the physical location of your business. 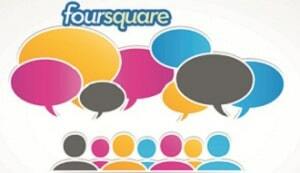 This will help Foursquare users to support your business on this social networking platform. Author Bio: Jem is fond of following the latest trends in technology especially on gadgets, Smartphones, social media, networking, internet and computers. I have been using Foursquare for several years off an on. Hopefully recent changes to the online platform will help it to gain some ground on other local geo tagging sites.